I conducted a mystery shop this week. I called an agent, and spoke to a lovely lady called Carol. Carol sounded like she was busy. Obviously, she wasn’t just waiting for my call, so no doubt she was doing something important like answering emails, writing property details or updating the company Facebook page. But I could have been a customer. The very person Carol’s job was created to attract and service. We have all this technology around us, seemingly to make our jobs easier, our tasks more effective, our customers happier. And yet, when I did get Carol’s attention, she asked for my details in a friendly but robotic way. I was asking her to send me some property details. She was in Bristol. I’m up in nosebleed-north. She was trying to fit me into her database fields. I was waiting for the opportunity to share my plans with her. Interesting: That house has the most amazing views; you can’t really tell from the photographs. Interested: Oh, that’s such a lovely part of the world. What brings you so far south? When are you next down for a visit? Could you squeeze in a viewing? When Carol answered my call, tech was not what she needed. She just needed to pay attention. When I train agency staff, I encourage them to turn away from their computer screens when answering the phone. It’s the simplest thing you can do to make sure you give the caller the attention they deserve, and be interested and interesting. You know what it’s like; you’re in the middle of a difficult email or crafting an awkward piece of copy, and the phone rings. No one else answers it so you do, but as the caller starts speaking, your head is still full of the task you were just doing. Right? By turning away from the screen and looking at something neutral in the office – even the wall will do – you’ll help your mind perform the transition it needs, so you can fix your focus on what the caller is saying. Technology can be your best friend, AND your worst enemy. We’ve all done it: sending an email when you know a call would be better, sending a text when the issue deserves an email, trying to fit a client’s bespoke requirements to a fixed set of database fields. Sometimes it’s better to ditch the tech; show your human side. It may seem a little 1997, but we still need that personal touch, that genuine interest, that authentic attention. That hasn’t changed and I don’t think it ever will. Selling houses will always be a people business. That’s what makes it so fascinating to those of us who love it with a passion. Like me. And you. 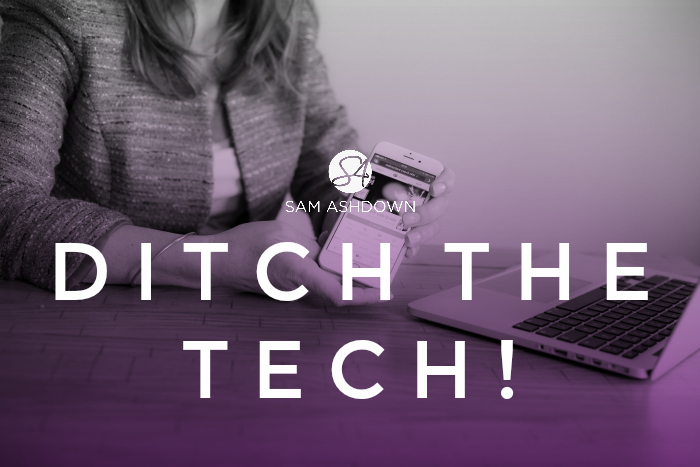 I’d love to know your thoughts on this topic – please, leave a comment, or if you’re shy, email me at sam@samashdown.co.uk. Next post Is your diary running your business? I totally agree to a point Sam. As a former estate agent and supplier of EA services (for a large part with technology companies), tech can make huge difference, very positively, to an agents success. However, more often than not it is either mis-used or staff totally ‘hide’ behind it. Ultimately estate agency is about people and relationships first. Not just waiting for enquiries to come from the ‘portals’, booking in a viewing and see which way the wind blows! As you say though.. bring back the personal, human touch.